The leader of the New York City bus and subway workers' union announced a citywide strike early Tuesday, four hours after rejecting a contract offer management described as "fair." The strike forces millions to find other ways to get around town, and activates emergency plans by the city - limiting travel by vehicles with less than four people - and numerous businesses, trying to avoid economic disaster. More than 7 million daily riders normally rely on the city's buses and subways - the largest mass transit system in the U.S. - and the 33,000-members of the Transport Workers Union. The Transport Workers Union rejected a contract offer at 11 p.m. and did not announce its strike decision until just after 3 a.m. Tuesday. Shortly afterward, lawyers representing management and the city began drafting a request to a judge to declare the workers in contempt of court for calling an illegal strike. Transport Workers Union Local 100 president Roger Toussaint, announcing the decision to strike, said that at a time when the Metropolitan Transportation Authority has a surplus of $1 billion, "this contract... should have been a no-brainer." "Make no mistake, these are bullying tactics and we will not accept them," said MTA chairman Peter Kalikow of the TWU's strike decision, adding that the walkout is "a slap in the face of all MTA customers and all New Yorkers." Toussaint says he does not understand why the MTA, in his view, has taken "a hard line" on health benefits and pension. Addressing the people of New York, Toussaint cast the union's strike as "a fight over whether hard work will be rewarded... a fight over dignity and respect on the job." New York City Mayor Michael Bloomberg was swift to respond to the strike announcement, calling the union's action "selfish" and a "cowardly attempt.. to bring the city to its knees." "We cannot give them the satisfaction," said Bloomberg, calling on New Yorkers to walk, bicycle and find other ways to get around to avoid shutting down businesses and schools and the "havoc" he says the union is intent on creating. The mayor - wearing a "I love New York" sweatshirt to underscore his message - went on to say that New Yorkers have a habit of getting through tough times and will once again prove that this is a city that works - "even when our buses and subways don't." The union, said Bloomberg, must understand that its actions have consequences. A contempt of court ruling for the union, which is being sought by the MTA and the city, could mean steep fine for the union's leaders and members: two days' pay for every day they are out on strike. Buses still on the road at the time the strike was called are expected to drop off all passengers and return to their depots. Subways will finish their trips as turnstiles are chained and locked. News of the strike sent many New Yorkers scrambling for their car keys, trying to get into town before 5 a.m., when most of Manhattan will be off-limits to vehicles trying to enter with fewer than four people. That rule will be in effect from 5 a.m. to 11 a.m. until the strike ends. Numerous car pool locations have also been set up. New York's subway has about 1.4 billion riders a year and is the fifth-busiest system in the world, behind Moscow, Tokyo, Seoul and Mexico City. Counting buses and commuter railroads, the MTA estimates that it moves 2.4 billion people a year. Mayor Bloomberg has said that a transit strike could cost the city as much as $400 million a day — a figure that includes police overtime and lost business and productivity. It would be particularly harsh at the height of the holiday shopping rush. The mayor has also said that a strike could freeze traffic into "gridlock that will tie the record for all gridlocks." The transit workers' old contract expired early Friday, but the union and the Metropolitan Transportation Authority agreed to keep talking through the weekend. The two sides are divided over wages and an MTA proposal to raise the age at which new employees become eligible for a full pension from 55 to 62. At a rally in Queens Monday, employees of the striking Jamaica Buses and Triboro Coach bus lines formed picket lines early in Queens, many chanting, "No contract, no work!" Later in the day, hundreds of union members rallied outside Gov. George Pataki's office in midtown Manhattan, partly blocking traffic and screaming for a transit system walkout. "Shut it down!" they chanted. 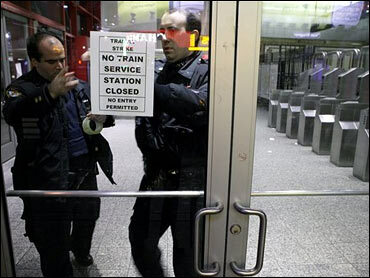 The companies serve about 50,000 commuters, and are in the process of being taken over by the MTA, meaning they are not yet covered by a state law that prohibits public employees from striking. The last citywide bus and subway strike in New York was in 1980. The walkout lasted 11 days.